US rapper, Pharrell Williams, has taken the final UK number one single of 2013 with “Happy” after the track, which features in 3D animated comedy Despicable Me 2, sold 107,000 copies in the last week. This video was shot in Bermuda with real Bermudians. Thanks for such great art, guys! 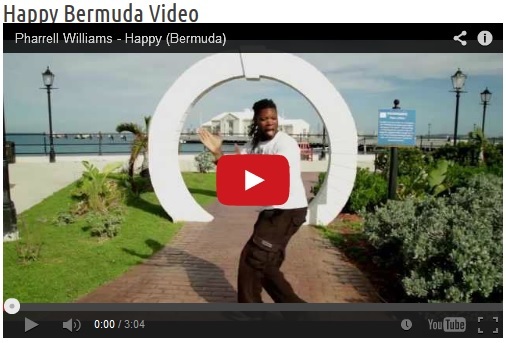 Video of Happy for Bermuda. An online video celebrating Bermuda has gone viral, receiving more than 55,000 views since being put on YouTube on Friday. ‘Happy (Bermuda)’, set to the Academy Award nominated song ‘Happy’ by Pharrell Williams, features dozens of people — and a few dolphins — dancing at iconic spots across the Island. Director Andrew Kirkpatrick, of BurntHouse Productions, said the song had already become a viral hit when a friend suggested that he put together a Bermuda-centric video for the song. “I thought I could do something, and I enlisted the help of some friends and went around the Island trying to capture Bermuda in all it’s beauty,” he said. Mr Kirkpatrick said that as he and fellow filmmaker Laura Siegfried drove around the Island, they came across more and more scenes and people that they wanted to include. While some people were nervous about dancing on camera, he said almost everyone they asked was willing to give it a go. “A lot of it was spontaneous. We were just going around town when we saw the Town Crier [Ed Christopher]. I just kind of grabbed him and asked if we could see him bust a move,” Mr Kirkland said. He said he and partner Nhuri Bashir decided the video would be a fantastic device to launch their new website, intobermuda.com, which they hope to use to advertise the Island through new media. Wow. Hats off to Andrew Kirkpatrick and the gang for this one!